A statement released by the hospital treating him said "his condition deteriorated over the last 36 hours and he was put on life support systems. Despite the best of efforts, we have lost him today." "India grieves the demise of our beloved Atal Ji. His passing away marks the end of an era. He lived for the nation and served it assiduously for decades. My thoughts are with his family, BJP Karyakartas and millions of admirers in this hour of sadness. Om Shanti," tweeted Indian Prime Minister Narendra Modi.Vajpayee was prime minister briefly in 1996 and 1998 before eventually serving a full term as premier from 1999 to 2004. He had been admitted in June to the All India institute of Medical Sciences in the capital, suffering from a urinary tract infection and chest congestion. His condition worsened, eventually becoming fatal. Vajpayee never married. 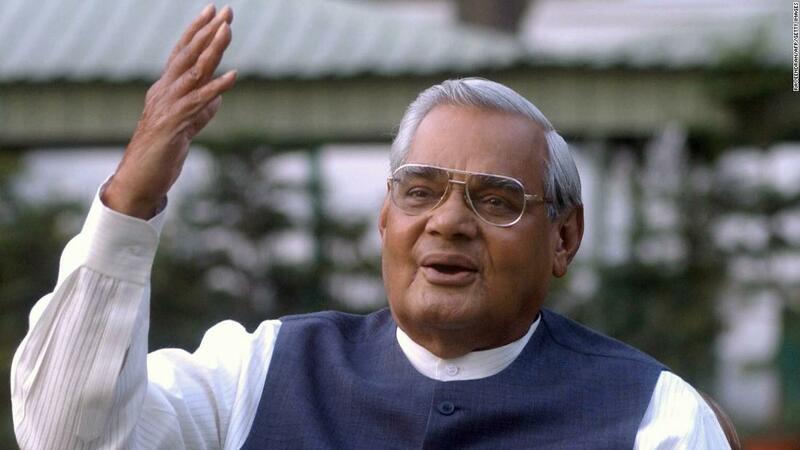 He is survived by his adopted daughter, Namita.During his political career, Vajpayee's name became synonymous in India with the rise of the ruling Bhartiya Janata Party (BJP), which he helped found in the 1980s. His ascent to the premiership signaled the renewal of the party, which had grown to become the main opposition to the Indian National Congress before eventually overtaking that party. Vajpayee's tenure as India's leader was marked by significant developments in the country's defense policy, and he oversaw India joining the world's nuclear weapons club in 1998. Facing heavy criticism at home and abroad over India's nuclear ambitions, Vajpayee defied the threat of economic sanctions, telling parliament that "we have never made a decision after coming under international pressure and we will never do so in the future." Born in December 1924, Vajpayee grew up in the central Indian state of Madhya Pradesh and was one of the founders of the Janata Party, a splinter group of which became the modern BJP. During his youth he was briefly a member of the right wing Hindu nationalist group Rashtriya Swayamsevak Sangh (RSS), and was arrested along with his brother in 1942 for protesting against British rule. Vajpayee won his first election to parliament in 1957, a decade after independence. He would go on to hold that role for nine terms. Though he was elected prime minister three times, Vajpayee only competed an entire term once. His first government collapsed in less than three weeks in 1996, and while he took power again in 1998, this only last 13 months before a disagreement within the ruling coalition sparked new elections. Vajpayee was returned to the premiership in 1999 after his BJP-led coalition secured a comfortable majority in the wake of a two-month long war with Pakistan over control of Kashmir. In late 2001, India's parliament was hit by a terrorist attack which Delhi blamed on Pakistan, while in 2002, riots in Gujarat claimed the lives of hundreds of Muslims. Despite India's contentious seven-decade relationship with Pakistan, Vajpayee is credited with being the only Indian leader to make significant progress in peace talks with the country's nuclear-armed neighbor. Even as he pursued a nuclear agreement with Pakistan, Vajpayee remained a defiant defender of India's security policy, an approach which eventually paid off. Economic sanctions imposed after the country's first atomic test were finally lifted in 2000 when Bill Clinton visited the country, the first US President to do so in 22 years. Vajpayee also improved relations with Beijing, officially recognizing Tibet as part of China. A talented orator, one of Vajpayee's most remembered speeches was a hugely critical one, bemoaning India's lack of progress after five decades of independence. "Our country is counted amongst the poorest in the world," he said. "We can't make primary education a necessity. We are still expecting that girls should be educated. The birth of a girl in this country is still a curse." More than 15 years after the speech was given, however, the country continues to be plagued by many of the same problems. Away from politics, Vajpayee is also remembered as an accomplished poet, releasing many books over the years filled with Hindi poems. Just as his fellow BJP prime minister, Narendra Modi, has focused on promoting "brand India," Vajpayee saw great success in building his country's reputation around the world. He addressed the United Nations General Assembly in 2001 and a joint session of the US Congress in 2000. Bilateral agreements signed between his government and Moscow set the stage for annual summits which continue to this day, as does the close relationship with China he cultivated. "At a time when an external stimulus has motivated us to unite against terrorism and for security, let us summon an equally strong inner resolve for development and poverty alleviation," Vajpayee said in his speech to the UN. "They are just as crucial for a global order at peace with itself."